The war effort had started out with volunteer units, each choosing its own uniform, many choosing uniforms that would entice young men raised on romantic tales. 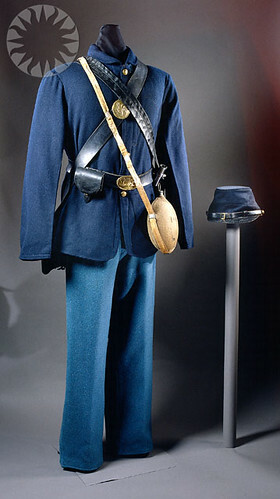 The Zouave units, particularly, wore examples of the “fantastic toggery” decried below. Some wore blue, some gray, and mistakes in identification had already cost time and lives on the battlefield, for instance at Wilson’s Creek, where approaching Confederates were mistaken for reinforcement by Union troops at first. McClellan enforced a policy of uniformity — seemingly a good thing in a uniform. The whole army of the U. S. is to be uniformed in blue. There is to be no more fantastic toggery. Some of the men in the army on the Potomac who were uniformed in grey, are getting ragged, but the Government will not permit any more grey clothes to be used. The boys must wait until they get blue clothes. Gen. McClellan is very energetic in his hostility to all uniforms except the regulation blue. This entry was posted in George McClellan, Union military. Bookmark the permalink. Found you on Twitter. Always looking for good resources on the Civil War. My great granddad was a Union surgeon. He was at Gettysburg and many battles before and after.